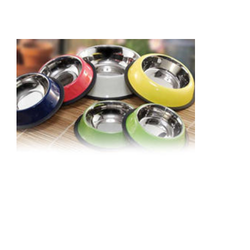 Jayna Steel India presents before you an exquisite range of stainless steel Anti Skid Dog Bowl Colored in various colors which can also be customized as per the demands of the client. Live the luxurious pet life with our Bamboo Bowl. These diners feature removable, bacteria resistant stainless steel bowls with an attractive poly resin exterior durable bases. The removable skid-free rubbers feet help ensure quiet, spill-free dining. These are available in different colors to match any decor. With the help of advanced facility, we are capable to provide an extensive range of Dog Steel Iron Bowl. In addition, we also provide customized options to cater the diverse demands of our patrons. 8 Oz. 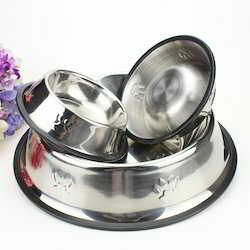 : These beautifully finished stainless steel based Non tip Pet Bowls come in mirror finish and Anti-skid Ring that safeguards the food against tipping from playful nudging activities of pets while lapping away the served nutritious contents.